Set in the early 1960s, in an America where racial segregation was rife, Green Book is an unusual road movie where the expected roles are reversed. No “Driving Miss Daisy” here. Instead the passenger sitting comfortably in the back seat, swathed in a push angora rug is a black man, while the driver, chauffeuring him around the deeply racist Southern States, is white. Based on a true story, a biography by Nick Vallelonga of his father, Tony “Lip” Vallelonga, it tells the tale of an assignment he accepted to drive an eminent pianist on an eight-week concert tour through the deep South. The Green Book of the title was a guidebook that was published specifically for African-American travellers in the Southern States detailing where they could eat and in which motels they were permitted to stay. Though the pianist, Don Shirley (a superb Mahershala Ali), and his trio were known nationwide and had played several times in the White House, in the South he was just another black man, forced to stay in second-rate accommodation and forbidden entry in many bars and restaurants. His choice of Vallelonga (an equally impressive Viggo Mortensen) as his driver is because he recognises in him a skill to diffuse, through diplomacy or, if called for, force, the difficult situations he is bound to encounter. Shirley, we learn, has not just accepted this extended tour organised by his record company, but had specifically asked to do it to underline and force a discourse on the lack of civil rights for black Americans. Reminding us at times of the Odd Couple, the prissy and, at times, pretentious Shirley is initially appalled by the coarse, garrulous Vallelonga but, as in many films of this type, the two gradually come to appreciate the qualities of the other and develop not only a tolerance, but a real friendship. The gradual thawing of the tension that was initially between them is told with a lot of humour and the chemistry between the two actors makes us not only believe it but care deeply for both characters. Our laughter, however, is always tinged with a hint that violence is just one step away and there are moments in the film when our fears become reality. Though director, Peter Farrelly’s film always keeps our attention there are scenes that verge on the sentimental and caricature. Vallalonga’s exuberant Italian family meal scenes could have been lifted from The Godfather or Goodfellas and are hard to take seriously and the almost superhero qualities he displays in extracting Shirley from tricky situations seems a little far-fetched but these are minor gripes. 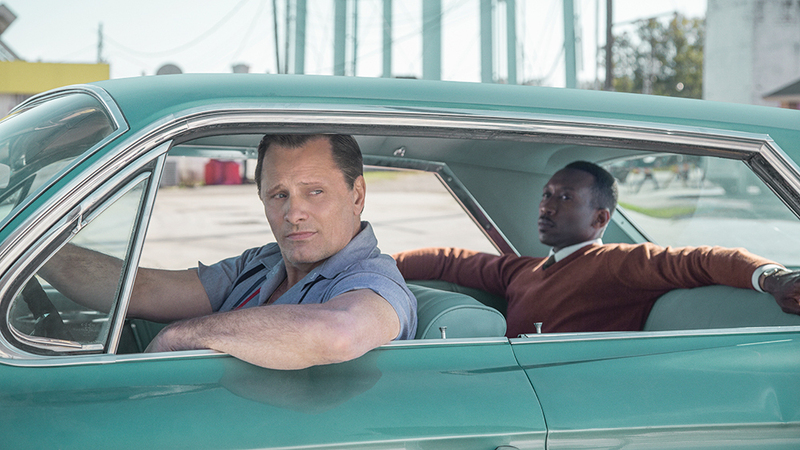 Green Book is an engaging and thoroughly enjoyable film but it is also more than that. It is a reminder of the personal struggles and sacrifices that courageous people must make every day to create a peaceful and equal society. It richly deserved the best film and best supporting actor awards in the Golden Globe ceremony and is sure to have equal success in the Oscars.